The notion of what constitutes “best practice” when it comes to prosecuting New Zealand patent applications over the past 4-5 years has changed almost as often as Australia has changed Prime Minister. Over this period, we’ve found that at least one of legislation (Act and Regulations), precedent law, Patent Office throughputs, examination protocols and international/bilateral obligations has remained somewhat fluid – and with it, the challenge for patent prosecutors to strike an appropriate balance between cost, scope and expediency has remained an imperfect science. In this article, we play some of these factors (as they currently stand) off against each other – and come up with some ideas as to how attorneys and applicants alike can effectively manage the prosecution of New Zealand patent applications so that the facility to file a divisional application is not compromised. As readers will know, New Zealand patent law has recently changed; on 14 September 2014, the Patents Act 1953 (the “old Act”) was replaced by the Patents Act 2013 (the “new Act”). On the one hand, this creates a binary old Act/new Act distinction – and as we will see, best practice differs appreciably depending upon which legislation governs any particular New Zealand application. However, as we will also see, life under the new Act is itself divisible into distinct pockets of time, each of which has caused our coveted “best practice” to fluctuate somewhat. Prosecuting applications under the old Act was (as remains, for any old Act divisional applications still pending) a fairly easy gig. Automatic examination, local novelty, no consideration of inventive step, fairly gentle written description requirements, no time limit on filing a divisional (other than it must be filed pre-acceptance of its immediate parent) and relatively slow Patent Office throughputs meant that somewhat broad New Zealand patents could generally be obtained with a relative minimum of time, hassle and expense. Often (albeit with a few notable exceptions relating to patentable subject matter), IPONZ was effectively only rubber-stamping what had gone before it in IP Australia, the EPO, USPTO or wherever. Under the old Act, New Zealand was very much a follow-on jurisdiction. Critically though – at least within the context of this article – “best practice” essentially took care of itself. As IPONZ throughputs were relatively slow (certainly, much slower than those of IP Australia for counterpart AU/NZ cases), and because divisional applications could be “daisy-chained” indefinitely, applicants faced little by way of time pressure. It was all biased a little too heavily in favour of the applicant and New Zealand’s patent landscape was becoming encumbered with thickets of overly broad (and possibly invalid, remembering that inventive step wasn’t examined, but was a ground for opposition and revocation) patents, granted principally to foreigners, at relatively minimal expense. Many, including the Government, felt that change was overdue. Applications filed in IPONZ on or after 14 September 2014 are subject to law and practice governed by the new Act (divisional applications filed from old Act cases notwithstanding). Generalising slightly – and with a few notable exceptions, new Act law and practice at the time of commencement was closely akin to life under Australia’s Raising the Bar reforms of 2013. To some extent, this was a natural consequence of the now-abandoned Single Application Process and Single Examination Process initiatives that took place between IP Australia and IPONZ. Examination was now commenced by way of formal request, inventive step was examined, heightened support and written description standards applied, and Patent Office turnarounds were published, somewhat aspirationally, on the IPONZ website. In a nutshell, New Zealand practice was now going to be quicker, stricter – and as a consequence, more labour-intensive and ultimately more expensive. Under the new Act, divisional applications still had to be filed pre-acceptance. However, in addition, a new 5-year statutory bar on requesting examination was introduced (which, due to the speed at which IPONZ was now operating, was unlikely to be a problem – more on that, below). As with the old Act, best practice under the new Act was effectively self-governing: IPONZ dictated the speed at which an application progressed through examination – and so long as a divisional was filed before acceptance of its immediate parent, the 5-year statutory bar was unlikely to raise its head for at least one further generation of application. The new Act effectively represented a 180-degree change in best practice – from slow, broad and cheap to fast, narrow(er) and more labour-intensive. However, the principal take-home has already been alluded to above: best practice under both the old Act and during the early days of the new Act was effectively self-governing. If an applicant did what IPONZ told them to do, when they told them to do it, their interests would be effectively preserved; attorneys didn’t need to exercise a great deal of imagination in terms of how best to manage timelines (including the 5-year statutory bar) during the early days of the new Act. During the early days of the new Act, a direction to request examination would generally issue around 7 months from the date of national phase entry. First exam reports issued fairly quickly – around 3-4 months later, setting in place a 12-month acceptance deadline. Adding everything up, the final acceptance deadline for a New Zealand national phase entry would generally fall around 40-45 months from its filing date, i.e., well within the 5-year/60-month statutory bar for not only filing, but also requesting examination of any subsequent divisional application/s. In other words, an applicant knew where they stood (relative to whether or not they needed to file a divisional application) comfortably within the deadline for doing so. Remember also, that the quoted 40-45 months is an “outside” timeframe also – for applications prosecuted actively (part of the reason for IPONZ’ new response deadline), further time could be saved – perhaps even enough to allow a full prosecution cycle for a first-generation divisional application before any decision on a second-generation divisional needed to be made. Fast forward to today. The backlog at IPONZ is now so deep that directions to request examination are no longer issuing at all; it’s all now on an applicant’s attorney to keep them apprised of the 5-year deadline and what is required of them within this period. Here’s an everyday example of “passive” attorney work (let’s call it “worst” practice): An applicant, in the absence of a direction, instructs its attorney to request examination shortly before the 5-year deadline; an examination report issues 6 months later raising a unity of invention objection that would otherwise be addressed by filing a divisional application. Oops… Alternatively, if an obviousness (or any other) objection cannot be overcome within the 12-month acceptance deadline, the facility to maintain pendency via a divisional application is again extinguished. In such circumstances, an applicant really does rely on its NZ attorney to have its back and come up with something a little more constructive than a passive prosecution strategy. Note, however, that any delay at IPONZ’ end is not with respect to the time taken to produce a first examination report; in fact, they remain fairly quick in this regard. Timeframes published on the IPONZ website range from 3 months (mechanical) to 6.5 months (biotech); this is considerably faster than the Australian Patent Office, which presently generates first reports in around 12-14 months across all technology spheres. 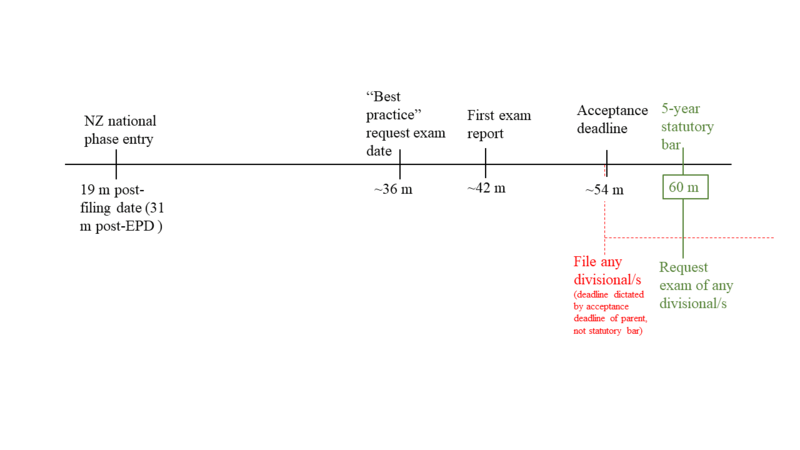 Any delay, as such, relates strictly to the absence of examination directions – and this is where “the problem” lies. In the absence of proactive case management by an its attorney, time can be a New Zealand patent applicant’s worst enemy. If the applicant finds itself backed into a corner from which the only escape is a divisional application, they had better hope that the 5-year statutory bar has not yet passed. As readers will appreciate, slower, stricter examination in IPONZ only serves to heighten this possibility – and with it, the imperative that attorneys are proactive in managing the deadline. Short of legislative reform to allow New Zealand law and practice to live together, there appears no “perfect” solution to this problem. The only way to effectively tackle the 5-year statutory bar is for an attorney to be both vigilant and proactive in managing it. If IPONZ isn’t going to issue a direction requiring an applicant to request examination, then this responsibility effectively now vests in the attorney – and internally, at our firm, we have adopted this practice. As such, the required action is clear: encourage the applicant to request examination as soon as possible upon NZ national phase entry. This maximises the chances that an applicant will have, at least, a first examination report prior to expiry of the statutory bar – and as such, will have at least a pointer as to where they may stand in relation to a potential divisional application. However, what is the perfect number? When should attorneys be reaching out to clients encouraging them to request examination? Of course, there is no right or wrong answer to this question – only a very general “the sooner, the better”. We’ve heard 3 years suggested recently (i.e., about 18 months post national phase entry) – and on the face of it, this seems as good as any other suggestion. It allows an applicant a period of financial recovery following national phase entry (remembering that national phase entry day is the most expensive time a patentee will face), and means that an examination report will issue in good time, setting the acceptance deadline (and with it, the first deadline for filing a divisional) comfortably before the 5-year statutory bar. We have attempted to show this in the timeline above. 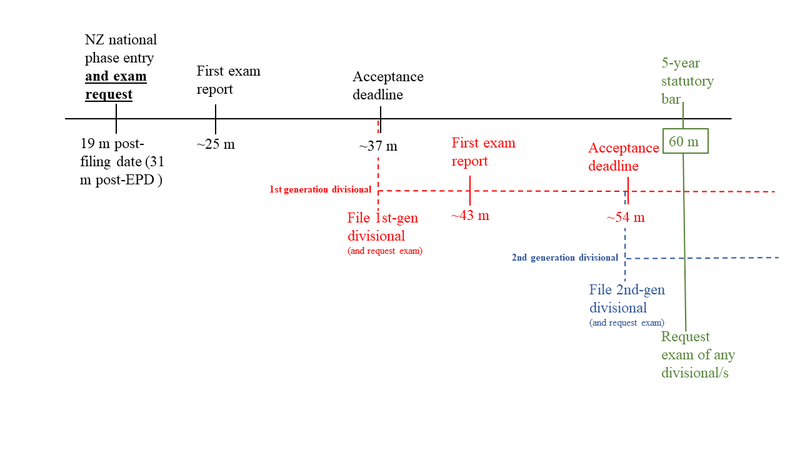 However, it will be appreciated that with the time increment between requesting examination and acceptance relatively consistent (depending upon technology) at around 15-18 months, the sooner examination is requested on a “parent” application, the more time is available for prosecuting a first-generation divisional prior to expiry of the statutory bar. In fact, if an applicant requests voluntary examination upon entering the NZ national phase, there is sufficient time (without rushing unduly) to begin prosecuting a second-generation divisional prior to expiry of the statutory barIn the appreciably-rare cases where more than two divisional are required, the applicant of course has the option of filing several at once (it doesn’t need to be one at a time). The take-home is that despite its apparent rigidity, New Zealand practice is flexible enough to accommodate any number of prosecution strategies. It simply requires proactive case management on the part of the attorney responsible. Whereas current IPONZ throughputs and the 5-year statutory bar may be, in practice, somewhat incompatible, there are some other measures available to an attorney that may help mitigate the risk that an applicant misses the deadline. Firstly, an attorney should review any international phase prosecution history for potential unity of invention issues. In this respect, New Zealand law is that same as that expressed under PCT Rule 13.2; if it is foreshadowed during international phase, there’s a good chance it will be raised during examination in IPONZ – all the more reason to request early examination and find out for sure. Secondly, an attorney should make use of the comprehensive online file wrapper facilities at either the USPTO or EPO. The majority of New Zealand patent applications are PCT national phase entries from US or EP first filings. Often, by the time the New Zealand national phase is entered, the precursor application will already be well advanced in its jurisdiction of origin. Is there anything in the recent file history that would suggest prosecution before IPONZ may be problematic? Patentable subject matter, strong obviousness citations, restriction requirements – any one of these would give an applicant cause to keep a close eye on the 5-year statutory bar. Is the 5-year statutory bar here to stay? Although it is possible that next year’s Patents Omnibus Bill may provide applicants with some relief from the 5-year absolute bar restriction, this is probably unlikely in practice. Rather, we believe that IPONZ will maintain its current position that management of the deadline is an applicant’s responsibility (of course, via its attorney). The reason we expect the status quo to be maintained reflects what has been a palpable shift in focus from the somewhat applicant-friendly old Act to the more third party-centric new Act – in other words, the New Zealand Government considers it in the public interest that an applicant’s position is established as quickly as possible so that third parties are not encumbered by the eternal pendency of divisional-upon-divisional-upon-divisional (i.e., daisy chaining). All things considered, this position is unlikely to change (although we’d be very happy to be proved wrong here). Any reasons why early examination might not be “best” practice? Perhaps the most significant downside to early examination is that post-acceptance amendments in New Zealand are fairly heavily restricted. Aside from correcting obvious mistakes, an applicant can generally only amend down (i.e., narrow) an accepted claim – you can’t broaden, and you can’t move sideways should a killer piece of prior art emerge after an application has been accepted. Although readers will appreciate that this is, of itself, a good reason to delay, rather than expedite examination in New Zealand, it should be tempered by the observations that: a) international phase searching is generally fairly comprehensive; b) IPONZ only rarely uncovers new prior art itself; and c) with the majority of New Zealand applications coming by way of the US or Europe, additional high-quality searching will usually have been completed well before the counterpart New Zealand case is due for acceptance – even if examination is brought forward, as suggested. Are there any other aspects of NZ divisional practice requiring proactive management? Unfortunately, yes. Self-collision is the big one. Although it’s outside the scope of this article, we’ve written previously on the subject of poisonous priority. Popular opinion seems to be that if the Patents Omnibus Bill is going to correct any aspect of NZ divisional practice, it’s probably going to be this, rather than the 5-year statutory bar. For completeness, another aspect of current NZ divisional practice that may/should be cleared up by the Patents Omnibus Bill is the concept of the “zombie” divisional. This occurs where a divisional is filed outside the 5-year statutory bar. The Patents Regulations 2014 don’t actually prevent filing outside of the deadline; they only prevent the act of requesting examination. As such, current NZ practice provides for zombie divisionals, which are filed validly, but cannot ever be examined and won’t ever have any legal effect; they just roam the patent landscape in a permanent state of undead. This is probably a loophole worth closing in the upcoming legislation. Conclusion – what is current New Zealand “best practice”? Reviewing international phase/EPO/USPTO prosecution histories shortly (g., 2-3 months) following NZ national phase entry. Incorporating any potential issues that may give an applicant cause to want/need to file a divisional into early advice following NZ national phase entry. Assuming it is in their best interests, counsel the applicant to request examination sooner, rather than later. Proactively managing IPONZ’ new response deadline (this action is largely self-regulating; IPONZ sets the deadline and attorneys/applicants need to comply). Avoiding, to the extent possible, applications going down to the wire in terms of the 12-month acceptance deadline. Rather, address the Examiner’s objections as soon as possible and if necessary or advisable, maintain the postponement of acceptance. Maintaining postponement of acceptance until such time as the applicant has made an informed decision regarding a divisional (remembering that acceptance of a NZ application triggers an unextendible bar on filing a divisional from it). Being cognisant of the restrictions on post-acceptance amendments under New Zealand practice – what are the chances of close prior art surfacing after the case has been accepted? Whilst juggling each of these six balls, keep the closest eye on the 5-year statutory bar deadline – and remember it’s not just for filing a (or all) divisional application/s – it’s for requesting examination. To conclude, if there’s one thing to take away from this article, it’s that these considerations are perfectly manageable – both individually and in sum. However, it requires an attorney who is in sync with the requirements and their limitations working in combination with an applicant who is prepared to prioritise – at least during the initial stages, a filing in what is likely one of the smaller jurisdictions in which they have elected to file. Whereas our personal preference is to request examination at the time of entering the NZ national phase, this must be offset against incurring further costs that can always be deferred. As always, it’s a case-by-case, client-by-client proposition – but it is eminently manageable.